Hi, Nick Seluk! Thank you for visiting Watch. Connect. Read. to celebrate The Sun is Kind of a Big Deal. I must ask: Why is the Sun kind of a big deal? Nick Seluk: There’s a big bright ball in the sky that allows the Earth to have life! Imagine something so important that people worshipped it before they had any clue what it was or how it worked. The Sun is the most important piece of our little solar system, and I can’t wait to help kids (and parents) learn why! I always encourage people to examine a book’s jacket and case cover. Why should everyone flip over The Sun is Kind of a Big Deal’s jacket? Nick: People will be led there by the red carpet, a perfect welcome to continued entertainment from the cover. Besides having a chance to memorize the ISBN, during their stay on the back cover they’ll be treated to more hints about the fun and funny style they can expect on the inside. But wait, there’s more! The jacket itself is a poster of our solar system! Gasp! I heard you shared The Sun is Kind of a Big Deal with The Saturn Globe, The Independent Planet, and The Galaxy Guardian. Did they give you good feedback? Nick: The Saturn Globe gave it a ringing endorsement, the Independent Planet was over the moon and the Galaxy Guardian thinks it’s a rising star. I’m honored to be a part of such a vast universe of good press! Picture books are the greatest thing we can get for our kids, because we can instill knowledge AND provide novelty without wasting space on more toys. You can never have too many! Mr. Schu, you should have asked me to juggle. I’m very bad at it and you would have been entertained. 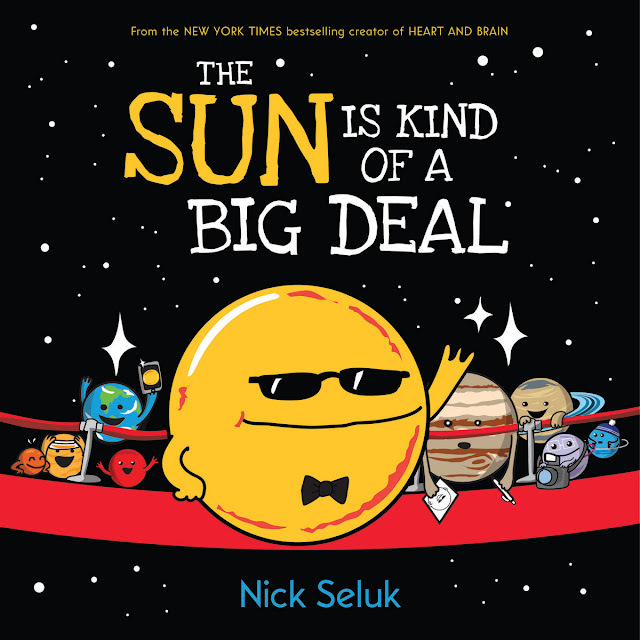 Look for The Sun is Kind of a Big Deal on September 25, 2018.